I guess most of you will know Jaden Jermy. He’s one of our most promising youngsters and has a new ECF grade of 123. He attends the Bury Knights Junior Club, as well as being a full and active member of the adult Bury St Edmunds club. Jaden “lives and breathes chess” and has ambitions to have a career as a top GM. His progress in recent months has been remarkable; he is unbeaten in the leagues since early November. As you may have read or seen elsewhere (local papers/TV) he was invited last weekend to the English Closed Championships, which is effectively a selection process for the England Squad. Seeded 13 out of 16 competitors, he finished unbeaten in 4th place. He has now been selected to play for England! Jaden lives in Thetford with his single Mum Michelle, who realises that the costs involved with travel, accommodation, etc will be prohibitive. She has set up a crowdfunding page for Jaden. 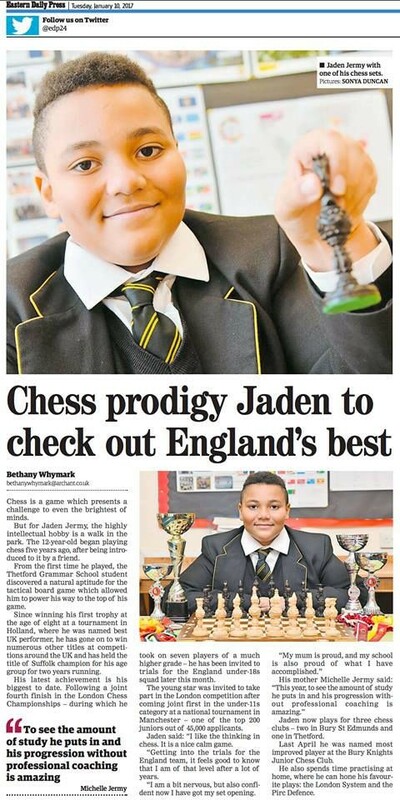 The aim is to secure £5,000 of sponsorship to enable Jaden to obtain high-level coaching (probably with Mike Harris) and to cover their travel costs. If you feel able to support Jaden, please go to his sponsorship page. Every small amount donated will help him achieve his goal. I've been a little tardy announcing this, so you're likely to already be aware, but the Mid-Season ECF grades were published on 30th January. You can find them on the ECF grading site: ecfgrading.org.uk or indeed on the Suffolk grading website: www.c4results.org.uk/chess.